Buckwheat is extremely easy to grow and offers many benefits to gardeners as a food source and to the environment as a cover crop. With so many positive attributes, buckwheat is a great crop to include in your spring planting lineup if you live in a region where it will thrive. Buckwheat is a fast-growing plant that begins to flower four weeks after it is sown and produces grain in eight to 12 weeks. It can be planted throughout summer until mid-August. If planting buckwheat as a cover crop, it can be planted in late spring or early summer. Before it goes to seed, you can turn it into mulch or green manure for the next crop you plant. Buckwheat does not do well with extreme temperatures. The ideal temperature for this crop is 70°F. Buckwheat doesn't tolerate frost, or even cold temperatures. The coolest temperature it can tolerate is about 50°F. Therefore, you should not plant buckwheat too early in the spring. Buckwheat also doesn't tolerate drought conditions or hot summers. Cornell University advises temperatures should be less than 90°F when buckwheat crops bloom to avoid heat blasting or flower blasting (blossoms opening deformed or buds failing to open). According to Mother Earth News, commercially grown buckwheat is concentrated in northern states due to hardiness zone temperatures. Commercial growers in the Northern plains in the Midwest also grow buckwheat. King's AgriSeeds indicates that buckwheat can be grown from North Carolina to Maine, depending on elevation and summer temperatures. The best way to determine if you live in a region suitable for growing buckwheat is to locate your hardiness zone. This will give you a guide for each zone and the first and last frost dates as well as temperatures. If you live in zones three through seven, this crop may fare well in your climate. Zone 3: The last frost date is May 15 and the first frost date: September 15. Zone 4: The last frost dates is May 15 to June 1 and the first frost date September 15 to October 1. Zone 5: The last frost date is typically May 15 and the first frost date is October 15. Zone 6: Last frost date is April 1 to April 15 and the first frost date is October 15 to 30. Zone 7: Last frost date is mid-April and the first frost date is mid-October. The growing season for Zones 1 and 2 are too short while Zones 8 to 13 are typically too hot for growing buckwheat. There are different methods for planting buckwheat seeds. Some gardeners prefer to plant seeds about an inch deep in narrow rows. Others prefer to scatter seeds randomly over raised beds (¾ of a cup of seeds for every 32 square feet or three ounces for every 100 feet). Cover the seeds with dry leaves or soil to prevent birds from eating them. Growing buckwheat offers several benefits. Cover crop: Many gardeners and farmers use buckwheat as a cover crop on tilled soil not currently being used for other plants or the soil is too poor for other plants. Before it goes to seed, buckwheat can be tilled back into the soil and used as a green manure. Buckwheat honey: Beekeepers plant buckwheat for the great symbiotic relationship it has with honey bees. Buckwheat flowers require bee pollination and the flowers provide bees with nectar that produces a dark and distinctively flavored honey known as buckwheat honey. Gluten-free protein source: Despite the name, buckwheat is not a wheat. It is actually related to rhubarb. 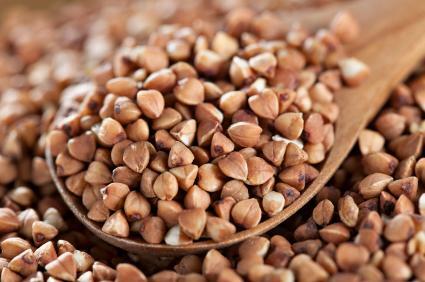 According to the World's Healthiest Foods.org, buckwheat is gluten-free and has a high concentration of amino acids that makes it an excellent source of plant protein. Antioxidant rich: Buckwheat is also a good source of minerals and antioxidants. According to the University of Missouri's Extension website, there are very few varieties of buckwheat grown in the U.S. The majority is referred to as "common" buckwheat. Other varieties include Canadian grown Mancan and Manor. A U.S. based company called Winsor Grain, Inc., produces a type of buckwheat known as Winsor Royal. 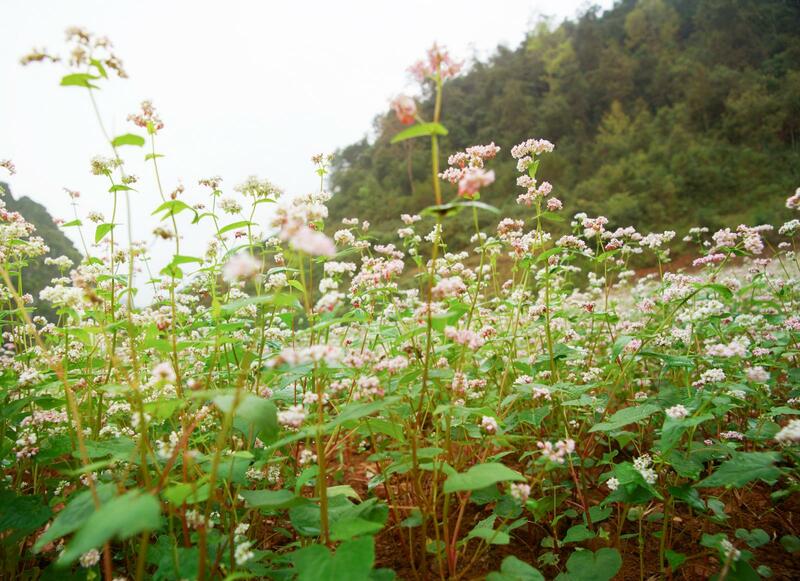 Other commercial buckwheat varieties include, Koto, Manisoba and Keukett that also suitable to grow in cooler summers in northern regions. All varieties typically have the same planting timelines. Buckwheat is ready to harvest when the grain (seed) is ripe around 8 to 10 weeks, when the seeds turn a dark brown. Most gardeners use threshing to remove the seeds, while commercial growers use windrowing or swathing methods. The grain is usually ground and mixed with other grains when used as feed for livestock, milled into flour for human consumption or used as poultry feed while still in seed form. From a cereal to a grain to a cover crop and a nectar for bees, buckwheat has a lot to offer growers. Depending on your hardiness zone, you may be able to grow buckwheat in your backyard and reap these great benefits.